The American Montessori Society (AMS) describes Montessori children as to be more independent and unusually adaptable. It focuses on the distinguishing characteristics that make Montessori education different from the Traditional education. Early in the twentieth century, Dr. Maria Montessori, Italy’s first woman physician, developed educational philosophy, materials and methods based on her scientific observations of young children’s behavior.Dr. Montessori’s study about the learning process of children brought her to the conclusion that children teach themselves based on what they find in their environment. 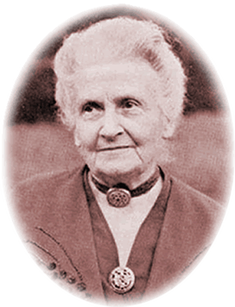 Her developed philosophy, methods, and materials eventually became known as the Montessori approach of education. ​Dr. Montessori designed the materials that invite the children to do purposeful activities in a prepared environment. Her goal was to provide an environment to the child where he has the freedom to explore and learn through movement and materials. Each activity and every task performed by the child takes him to the next level eventually leading him to acquire a specific skill. All equipment used in Montessori classroom have sequence and interrelation in order to deliver a specific concept to the child, fulfilling the utmost goal of development of his potentials to its fullest. The Montessori philosophy is based on personalized and individualized approach of education. The basic objective of providing Montessori environment to the children is to respond to their natural tendency to work and aid their task of inner construction as they grow from childhood to maturity.